The producers of the Broadway concert ROCKTOPIA are thrilled to announce that multi-platinum Rock and Roll Hall of Famer ROBIN ZANDER, lead singer of CHEAP TRICK, will make his Broadway debut as a special guest vocalist in the show for the final week of its limited engagement, April 23 – 29, 2018. 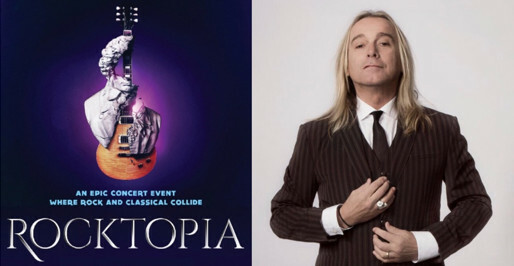 An explosive concert event that fuses the most iconic 20th-century rock with world-renowned classical masterpieces, ROCKTOPIA features the works of musical innovators across centuries—including Journey, Mozart, Queen, Beethoven, Aerosmith, Handel, Led Zeppelin, Tchaikovsky, U2, Copland, Heart, Puccini, The Who and more—performed by an elite lineup of vocalists, a five-piece rock band, a forty-person choir, and a twenty-piece orchestra. ROCKTOPIA celebrates its opening night at the Broadway Theatre on Tuesday, March 27. Tickets are now on sale at Telecharge.com. Zander and Cheap Trick first hit the music scene in 1974 with their unique blend of punk, pop and metal – a sound which catapulted the band to international stardom with such hits as "I Want You to Want Me," "Surrender," and "Dream Police." Forty years and twenty-five albums later, Zander is still widely considered one of the greatest rock voices of all time, and in 2016 the band was inducted into the Rock and Roll Hall of Fame. Zander joins ROCKTOPIA’s diverse lineup of celebrated rock, Broadway, and opera vocalists: Co-creator Rob Evan (Broadway: Les Misérables, Jekyll & Hyde; Trans-Siberian Orchestra); Chloe Lowery (Trans-Siberian Orchestra, Chris Botti, Yanni’s Voices); Tony Vincent (American Idiot, We Will Rock You, RENT); Kimberly Nichole (NBC’s "The Voice,"); and Alyson Cambridge (The Merry Widow at the Met Opera, Madame Butterfly, La Boheme, Show Boat). As previously announced, Grammy Award winner Pat Monahan, lead singer of the multi-platinum-selling band Train, will make his Broadway debut as the featured guest vocalist for the first three weeks of the concert’s run, March 20 – April 8. The world-class musicians featured in the ROCKTOPIA band include Grammy and Emmy Award nominated violinist Máiréad Nesbitt (Celtic Woman, Lord of the Dance); acclaimed guitarist Tony Bruno (MD & guitar for Enrique Iglesias & Rihanna, "America’s Got Talent"); pianist Henry Aronson (Rock of Ages, The Who’s Tommy); bass player Mat Fieldes (The Gorillaz, Book of Mormon); and drummer Alex Alexander (David Bowie, Jimmy Cliff, Ritchie Blackmore), under the baton of ROCKTOPIA co-creator Maestro Randall Craig Fleischer (San Francisco Symphony). An inaugural performance of the show, "Rocktopia: Live from Budapest" produced by Two Hands Entertainment/Jeff Rowland, was recorded in front of a live audience in June 2016 at the 19th century Hungarian State Opera House for PBS. It was performed with the Budapest Philharmonic Orchestra with six vocalists, a five-piece rock band, the Hungarian State Opera Chorus, and the Jazz and More Choir. ROCKTOPIA has since toured over twenty cities in the United States, featuring local symphonies and choirs across the country. The performance schedule is Monday, Tuesday & Thursday at 7:30pm, Friday at 8pm, Saturday at 2 & 8pm, Sunday at 2 & 7pm. There is no performance on Monday, March 26 or Tuesday, April 3. Performances have been added on Wednesday, March 21 at 7:30pm; Wednesday, March 28 at 7:30pm; and Wednesday, April 4 at 7:30pm. Pat Monahan will perform in all shows between March 20 – April 8, with the exception of March 21.